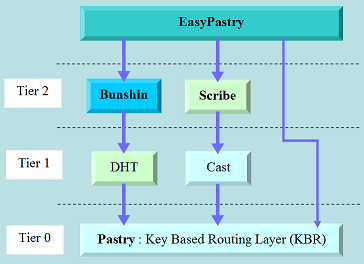 EasyPastry is built on top of Pastry, a decentralized key-based routing (KBR) P2P overlay network. The main objective of EasyPastry is to provide a complete façade in order to simplify the p2p application development. Moreover, EasyPastry take the Common API like their own layered architecture and use the implementations of Bunshin (DHT) and Scribe (Cast). A diagram can be seen just below. * Easy Node Starting: Using PastryConnection and a simple xml file. * Multiple Nodes in Local : Without modify the xml file, we can start N nodes in the same machine. * DHT and Cast Abstractions : Using DHTHandler and CastHandler we have direct control of these applications. * Key-Based Routing methods : Unified access to routing and messaging method via CastHandler. * DHT Consistency : What happens if we have a previous value and then a new value appears for the same key? Distribution: Source and binary code, written in Java v1.6 and compiled in Java v1.6. License: EasyPastry is available under a LGPL-like license. eAula is an Java EE Servlet Application, which has been developed using EasyPastry. It benefits from EasyPastry services, and it is an application for folder and file sharing across the decentralized web server (i.e. Jetty) network. Distribution: Source and binary code, written in Java v1.6 and compiled in Java v1.6. License: eAula is available under a LGPL-like license. Release Notes: Initial version, based on EasyPastry 0.1. Documentation : Master Thesis Report (in catalan).